The quilting is done – just the binding left to do. 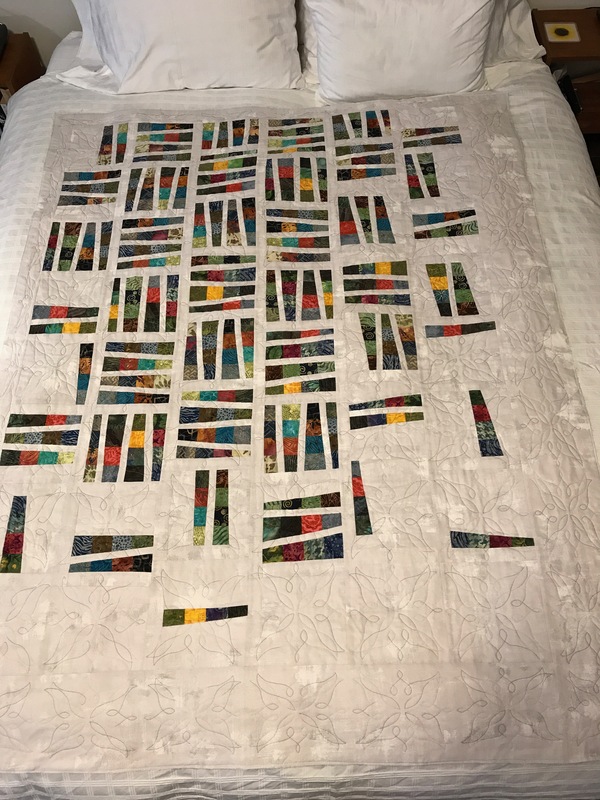 I’ve decided to bind the quilt with the same background fabric which will accent the colourful blocks and strengthen the off-centeredness of the design. A coloured binding would pull your eye away from the design elements – a binding in the same backing fabric will blend with the borders. The quilting itself was a challenge because I’d chosen to quilt it as if it had been regular blocks but I was short a vertical sashing on one side and across the bottom which left me having to resize the quilting design at least once in each column – you can’t really see the different size blocks but it meant measuring each “block” as I was quilting to make sure I was using the right size design to fill it. Also, I had difficulty with the quilt backing – I’d been careful to smooth it out when I wound it onto the 1×4 board, but there was a small uneven distribution of backing fabric toward the strip insert resulting in backing overlaps within a couple of blocks which I didn’t discover until after they’d been quilted, which meant I had to unstitch those blocks, spray them with Best Press to shrink the fabric as much as possible, before rehooping the block and restitching it. 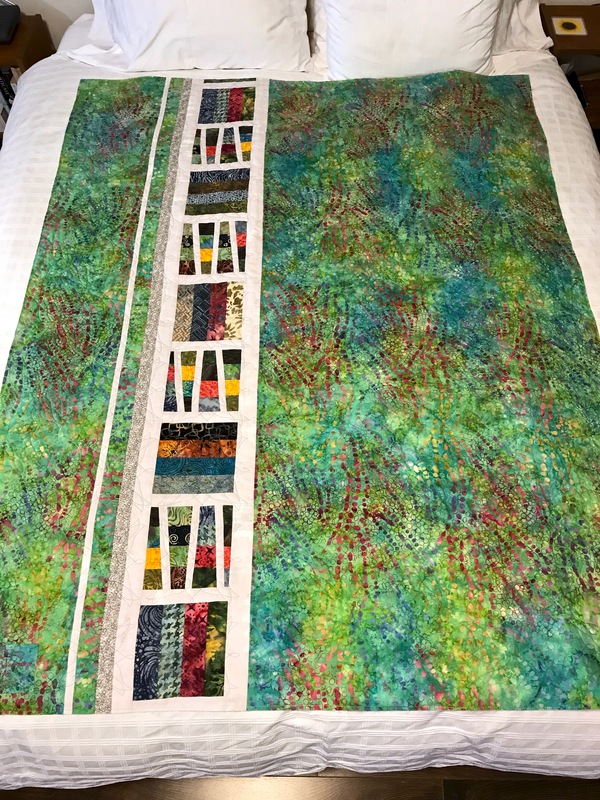 In the end the quilting worked out, the backing is laying flat, and the borders turned out balanced – in particular, I was able to start and stop the embroideries in the narrow border so they abut perfectly! Tomorrow I’ll add the binding and the quilt will be finished. Then on to the next one.